Regina is a USET Bronze and Silver Medalist, a USDF Silver Medalist, and a Level III Centered Riding® Instructor/Clinician. As a well-respected international clinician and successful competitor, Regina Liberatore’s instruction has a strong foundation based on equitation for the sake of effective riding. Lessons are given in the disciplines of dressage, hunters, and jumpers. Creating harmony between horse and rider is the main focus that riders work towards, regardless of their experience level. 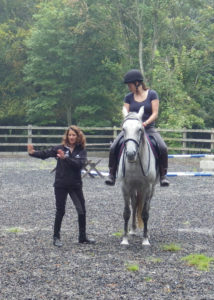 Regina is trained to watch the way a rider’s body moves as well as the horse. Trainers need to be excellent observers so they can communicate direction in easy-to-understand terms. Regina excels at both. 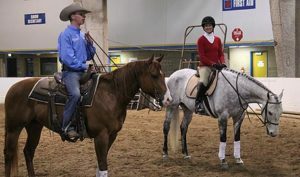 Regina and western performance trainer Andy Kurtz have developed the Common Ground Clinics. These clinics are held around the country and have proven tbe very popular with both english and western riders of all levels. Regina is a multi-discipline rider and instructor. Whether you ride English or Western, jump, Event or ride trail, she can help build your skill set and improve the working relationship between you and your horse.